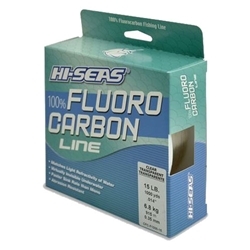 Hi-Seas 100% Fluorocarbon line is made from the highest grade of pure polyvinylidene fluoride and extruded to exacting quality control standards. It matches the light refractivity of water making it virtually invisible. Supple and easy to cast, Hi-Seas 100% Fluorocarbon is an excellent specialty running line. Pro bass fishermen are using it for a variety of finesse techniques and in super clear lakes because it sinks faster than mono, is undetectable by fish, and remarkably tough. Fluorocarbon increases hits and provides extra security against chafe and abrasion. Hi-Seas 100% Fluorocarbon was the winning line of the 2013 BassMaster Classic!